Integrated systems using surface plasmons offer great potential for use in quantum state engineering applications, such as single-photon sources and transistors (important for quantum communication and computing). 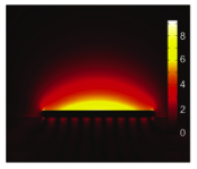 Here, novel capabilities in the way the electromagnetic field can be localized and manipulated offer the prospect of miniaturization, scalability and strong coherent coupling to single emitter systems that conventional photonics cannot achieve. Multipartite entangled states, called cluster states, can be used as resources to perform quantum computing. Here, the amount of control one needs over a quantum system is reduced to the ability of performing just single-qubit measurements. This is an important advantage over competing computational models for a number of physical systems, most notably those using photons. Improving photon generation rates using new types of sources, such as photonic crystal fibres, and understanding better the practical requirements for generating high-quality entanglement between these sources will open up access to larger entangled states with more complex structures than currently available. This would enable the testing of quantum protocols and probing physical phenomena that only more sizable quantum systems are able to support. Symmetries within entangled states make them suitable resources for carrying out quantum networking protocols, such as telecloning, open-destination teleportation and quantum secret sharing. Some of these have recently been demonstrated in four- and six-photon settings. Decoherence is the ubiquitous loss of information encoded in a quantum system due to its uncontrollable interaction with an environment. It is one of the main obstacles in the grounding of quantum technology for massively parallel information processing. The design and testing of fault-tolerant protocols counteracting the effects of decoherence is necessary for the achievement of reliable quantum information processing.